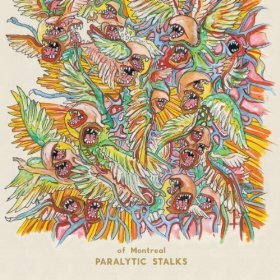 Indie progressive rockers of Montreal recently released Paralytic Stalks and honestly, I’m not quite sure they (or should I say Kevin Barnes) should have. Not that it’s a difficult project to listen to, but Paralytic isn’t wholly psyche-pop-funk like 2010’s False Priests, and it’s not completely indie rock either. But is Kevin Barnes ever solely described as only one thing? Thus the album lay somewhere between soft rock, classical music and some crazy psychedelia. It’s unusual, dark and personal. There are no catchy hooks, no guest appearances either. And once again Barnes produces, arranges, records and engineers the entire set, but this time it seems he’s the only one who understands it. Of the nine-track mix, lead single “Dour Percentage” is the most radio-friendly. It’s vaguely indie pop rock. “Ye, Renew the Plaintiff” stays the same course, as does opener “Gelid Ascent” (sans minute-plus intro). Overall, for true of Montreal fans, this will likely be their version of eclectic genius at its best.